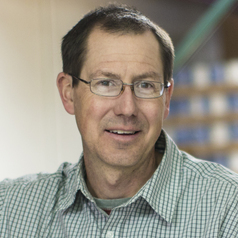 Matt Russell is Resilient Agriculture Coordinator at Drake University Agricultural Law Center where he is responsible for projects relating to improving the opportunities in Iowa's agricultural and rural economy. He joined the Center staff in April 2006 and has worked on issues concerning retail agriculture, land tenure, conservation, climate change, farmer veterans, rural development, state food policy, and federal farm policy. Matt grew up on a family farm near Anita, Iowa, received his B.A. from Loras College in Dubuque, and studied for the Catholic Diocese of Des Moines at the University of St. Mary of the Lake, Mundelein Seminary in Illinois. In 2003 he earned an M.S. in Rural Sociology from Iowa State University. In addition to his work at Drake, Matt and his husband Patrick Standley operate Coyote Run Farm, a 110 acre farm in rural Lacona and market fresh produce, eggs, and beef at farmers markets and other local outlets. He serves on the Iowa Farm Service Agency State Committee of the USDA. Before coming to Drake, Matt worked as an organizer for Iowa Citizen Action Network, worked for the National Catholic Rural Life Conference, and taught at Bishop Gorman High School in Las Vegas, Nevada. He has taught Sociology at Des Moines Area Community College and undergraduate courses at Drake about Cuba in transition and agriculture policy. His work on food and agriculture, has taken him to 26 states, the District of Columbia, Scotland, Italy, and Cuba.